Theodor de Bry. Americae pars qvarta. Sive, Insignis & admiranda historia de reperta primùm Occidentali India à Christophoro Columbo anno M. CCCCXCII, [Francofvrti ad Moenvm], [Typis I. Feyrabend, impensis T. de Bry], 1594. Theodorus de Bry (1528-1598) was born in Liege, Belgium and became a famous engraver, goldsmith, and editor who traveled around Europe. He created a large number of engraved illustrations for his books. He was the father of Johann Theodor de Bry and Johann Israel de Bry. 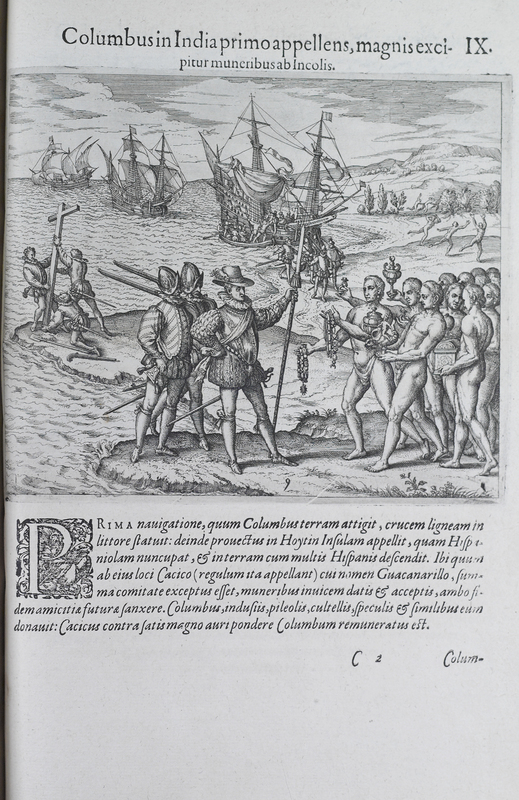 The illustration shown depicts Christopher Columbus arriving in the West Indies to exchange goods and communicate with the natives. Natives and Spanish explorers are shown wearing their typical clothing of the time.